*NEW PERKS! * 10% discount available year-round on Retail Items; cannot be combined with other offers. *NEW PERKS! * 10% discount available year-round on Featured Guest Instructor Workshops (workshops only not on Guest Instructor Privates or Semi-Privates); cannot be combined with other offers. Monthly Membership charges will be processed monthly on the same date throughout the term of the contract. Termination: After three months, you are allowed to terminate your membership for no extra cost (pro-rations for example if on a special $25 per month and regular price is $85 per month the difference $60 of each month used prior to the 1st 3 month will be incurred) You must do so by emailing contact@fitforagoddess.com and asking for a membership termination. 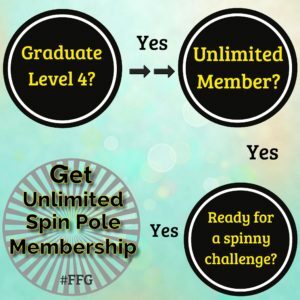 When adding on the Unlimited Spinning Pole Membership, the add on price of $25 additional per month is based upon you, the student being a current 6 month unlimited member. Termination of the 6 Month Unlimited Membership disqualifies you from the add on price ($25 per month) a new 6 month term will start if you want to keep the Unlimited Spinning Pole Membership at the regular price of $85 per month.